Introduction : Recent studies have reported differential physiological and psychological effects produced by exclusive right and left nostril breathing and clinical research is required to prove immediate and sustained efficacy of these techniques in various psychosomatic conditions such as hypertension (HT). The present study was designed to determine immediate effects of 27 rounds of exclusive left nostril breathing, a yogic pranayama technique known as chandra nadi pranayama (CNP) on cardiovascular parameters in patients of essential HT. Materials and Methods : Twenty two patients of essential HT under regular standard medical management were individually taught to perform CNP by a qualified yoga instructor with a regularity of 6 breaths/min throughout a performance of 27 rounds of CNP. Pre and post intervention heart rate (HR) and blood pressure (BP) measurements were recorded using non-invasive semi-automatic BP monitor and Students t test for paired data used to determine significant differences. Results : Twenty seven rounds of CNP produced an immediate decrease in all the measured cardiovascular parameters with the decrease in HR, systolic pressure (SP), pulse pressure, rate-pressure product and double product being statistically significant. Further, gender-based sub-analysis of our data revealed that our male participants evidenced significant reductions in HR and SP with an insignificant decrease in diastolic pressure, while in female participants only HR decreased significantly with an insignificant decrease in SP. Discussion and Conclusion : It is concluded that CNP is effective in reducing HR and SP in hypertensive patients on regular standard medical management. To the best of our knowledge, there are no previously published reports on immediate effects of left UFNB in patients of HT and ours is the first to report on this beneficial clinical effect. This may be due to a normalization of autonomic cardiovascular rhythms with increased vagal modulation and/or decreased sympathetic activity along with improvement in baroreflex sensitivity. Further studies are required to enable a deeper understanding of the mechanisms involved as well as determine how long such a BP lowering effect persists. We recommend that this simple and cost effective technique be added to the regular management protocol of HT and utilized when immediate reduction of BP is required in day-to-day as well as clinical situations. The nasal cycle is dependent upon tonic activity of the limbic autonomic nervous system with hypothalamus as the control centre, as well as levels of circulating catecholamines and other neuro-hormones. , Recent studies have reported differential physiological and psychological effects produced by exclusive right and left nostril breathing. ,,, However, these studies have only evaluated the effects on normal subjects. Though potential health benefits of unilateral forced nostril breathing (UFNB) have been postulated, further clinical research is required to prove immediate and sustained efficacy of these techniques in various psychosomatic conditions such as hypertension (HT) and diabetes mellitus (DM). With the above in mind, the present study was designed to determine immediate effects of 27 rounds of exclusive left nostril breathing, a yogic UFNB pranayama technique known as chandra nadi pranayama (CNP) on cardiovascular parameters in patients of essential HT. This study was conducted at the Advanced Centre for Yoga Therapy Education and Research (ACYTER) that has been established as a collaborative venture between the Morarji Desai National Institute of Yoga, New Delhi and Jawaharlal Institute of Post Graduate Medical Education and Research (JIPMER), Puducherry with funding from Department of AYUSH (Ayurveda, Yoga and Naturopathy, Unani, Siddha and Homeopathy) in the Ministry of Health and Family Welfare, Government of India. Ethical approval has been obtained by ACYTER from the Institutional Ethics Committee for studies on the effect of yoga therapy on HT and DM. The present study was conducted as a pilot study as part of this larger study on the effects of yoga therapy in patients of HT. Twenty two patients of essential HT attending the Yoga OPD run by ACYTER were selected for this study by accidental sampling. Patients whose SP was less than 120 mm Hg with medication, patients of secondary HT, and those with history/signs and symptoms/laboratory reports suggestive of nephrologic, neurologic and ophthalmologic complications were excluded from the study. Twelve of the patients were males and 10 were females with an average age of 58.14 ± 1.69 (SEM) years. All of the subjects were under regular standard medical management for more than five years with antihypertensive medications at JIPMER. Sub classification of the subjects according to JNC VII  revealed that based on either systolic pressure (SP) or diastolic pressure (DP) values, 16 were in the prehypertensive range, 4 in stage I HT and 2 in stage II HT even with regular medication. None of them had any previous experience of yoga training. Informed consent was obtained by one of the investigators. Pre intervention heart rate (HR) and blood pressure (BP) were recorded after 5 min of rest in sitting posture using non-invasive semi-automatic BP monitor (CH - 432, Citizen Systems, Tokyo, Japan). The subjects were individually taught to perform CNP by a qualified yoga instructor. An overview of the practice was given to the patients and then they were instructed to take up an erect sitting position with palms on their thighs. They were asked to keep their eyes closed to facilitate the development of inner awareness. The subjects were instructed to perform nasika mudra with their right hand, by touching the tip of their index finger to the base of their thumb. The right thumb was then used to close their right nostril with gentle pressure. The pranayama was then performed through the unblocked left nostril in a calm and regular manner with a conscious effort to use low, mid and upper parts of the lungs in a sequential manner for both inspiration and expiration. Subjects were instructed to breathe in and out for an equal count of 5 that was given by the instructor throughout the period in tune with a stop watch. A regularity of counts at the rate of 6 breaths/min (BPM) was maintained by the instructor for the entire duration of nearly 5min taken to complete 27 rounds of CNP. Post intervention HR and BP measurements were recorded again at the end of the 27 rounds of CNP. Pulse pressure (PP) was calculated as SP-DP, mean pressure (MP) as DP + 1/3 PP, rate-pressure product (RPP) as HR × SP/100 and double product (Do P) as HR × MP/100. Statistical analysis of pre and post intervention data was done using GraphPad InStat version 3.06 for Windows 95, GraphPad Software, San Diego California USA, www.graphpad.com. All data passed normality testing by Kolmogorov-Smirnov test and hence was analyzed using Students t test for paired data. P values less than 0.05 were accepted as indicating significant differences between pre and post intervention data. 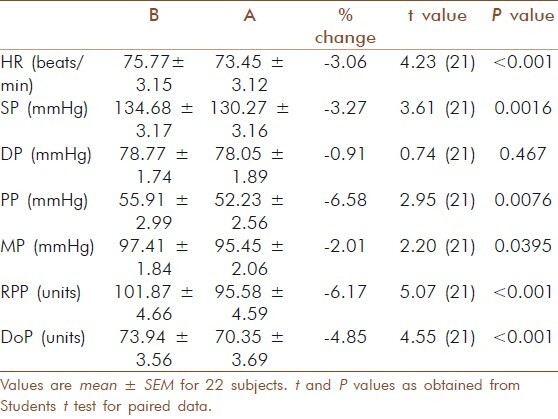 Results of the pre and post intervention comparisons are given in [Table 1]. All values are given as mean ± SEM. 27 rounds of CNP produced an immediate decrease in all the measured cardiovascular parameters with the decrease in HR, SP, PP, MP, RPP and Do P being statistically significant while the fall in DP missed statistical significance. Students paired t test showed significant reductions in HR, t (21) = 4.23, P <0.001, SP, t (21) = 3.61, P = 0.002, PP t (21) = 2.59, P = 0.0076, MP t (21) = 2.20, P = 0.039, RPP, t (21) = 5. 07, P <0.001, Do P, t (21) = 4.55, P <0.001. Further, gender based sub-analysis of our data revealed that the male participants evidenced significant reductions in HR, t (11) = 2.48, P = 0.03 and SP, t (11) = 2.97, P=0.013 from 73.17 ± 3.78 to 71.25 ± 3.70 beats/min and 132.75 ± 4.55 to 128.08 ± 4.71 mm HG respectively. The decrease in DP from 77.91 ± 3.04 to 75.58 ± 2.99 mm HG just missed significance t (11) = 2.09, P = 0.06. On the other hand in female participants, only HR decreased significantly from 78.90 ± 5.28 to 76.10 ± 5.31 beats/min, t (9) = 3.56, P = 0.006 while the decrease in SP from 137.00± 4.46 to 132.90± 4.14 mm HG just missed significance, t (9) = 2.05, P = 0.07. There was a statistically insignificant rise in DP in female participants 79.80 ± 1.33 to 81.00 ± 1.87 mm HG. We have earlier reported that the practice of sukha pranayama for 5 min at a rate of 6 BPM reduces HR and BP in patients of hypertension. In both that study as well as the present study we have found significant reduction in SP values that were on the higher side despite regular medication. However we have found in both studies that DP didn't change much and this may be attributed to the fact it was already stabilized within the normal range with medication. The cardiovascular effects in the present study as well as our previous one are more pronounced with regard to the RPP and Do P due to the cumulative benefits occurring as a result of reduction in HR as well as BP. RPP and Do P are especially important in patient care as they are indirect indicators of myocardial oxygen consumption and load on the heart, thereby signifying a lowering of strain on the heart. The RPP also provides a simple measure of overall heart rate variability (HRV) in hypertensive patients and is a surrogate marker in situations where HRV analysis is not available. Hence, the reduction in RPP in our study implies better autonomic regulation of the heart in hypertensive patients. A previous study from our laboratories reported that pranayama training of three months duration modulates ventricular performance by increasing parasympathetic activity and simultaneously decreasing sympathetic activity. This may explain significant decreases in HR and BP observed in the present study with pronounced effects on the heart. Our findings are in agreement with those of a previous report that left UFNB at the rate of 6 BPM lowers HR with compensatory increase in stroke volume and end diastolic volume. Another study done on normal volunteers reported a significant decrease in SP and MP following 30 min of exclusive left nostril breathing while the small reduction in DP in that study also missed significance as in ours. This shows that similar beneficial effects can be obtained in hypertensive patients even after less than 5 min of pranayama practice. Interestingly Raghuraj and Telles reported a significant increase in HR whereas we have found a significant decrease in HR in the present study. They suggested that the fall in SP may have been influenced by changes in cardiac output (CO), peripheral vascular resistance and humoral factors. However the rise in HR in their study doesn't support the contention of changes in CO and if there was change in peripheral vascular resistance, it should have been reflected in the DP changes. As the HR reduced significantly in our study, it is more plausible that the fall is SP is related to CO. They had not used timed breathing rates in their study whereas our subjects were breathing at the rate of 6 BPM and this may have harmonized respiratory and cardiovascular Meyer rhythms, resulting in changes in HR as well as BP. Breathing at the rate of 6 BPM increases vagal modulation of sinoatrial (SA) and atrioventricular (AV) nodes  and enhances baroreceptor sensitivity  by entraining all RR interval fluctuations, thereby causing them to merge at the rate of respiration and to increase greatly in amplitude. This increase in RR interval fluctuations enhances baroreflex efficiency and may have contributed towards lowering the BP. Increase vagal modulation of SA and AV nodes along with enhancement of baroreceptor sensitivity may be responsible for reduction in HR and subsequent fall in SP evidenced in our study. Interestingly the gender based sub-analysis of our data reveals that our male participants evidenced significant reductions in HR and SP with an insignificant decrease in DP while in female participants only the HR decreased significantly with an insignificant decrease in SP. The statistically insignificant increase in DP in our female participants as opposed to its decrease in our male participants seems to have influenced the overall result with regard to DP. Similar differences between genders following UFNB have been reported suggesting that there may be a nostril laterality affecting the autonomous nervous system differentially in males and females. The differential effect on BP between genders as evidenced by our study is in agreement with another previous study in normal healthy volunteers that reported significant reduction in HR, SP and DP after 15min of left nostril breathing in males while the reduction in females was significant only with regard to HR. The different response of our female participants may also be due to the fact that most of them were peri and postmenopausal and this may have influenced their autonomic status. It is concluded that CNP is effective in reducing HR and SP in hypertensive patients on regular standard medical management. To the best of our knowledge, there is no previous published report on immediate effects of left UFNB in patients of HT and ours is the first to report on this beneficial clinical effect. This may be due to a normalization of autonomic cardiovascular rhythms with increased vagal modulation and/or decreased sympathetic activity along with improvement in baroreflex sensitivity. Further studies are required to enable a deeper understanding of the mechanisms involved as well as determine how long such a BP lowering effect persists. We recommend that this simple and cost effective technique be added to the regular management protocol of HT and utilized when immediate reduction of BP is required in day-to-day as well as clinical situations. The authors thank Selvi L Vithiyalakshmi, yoga instructor ACYTER for her assistance during the study. We also thank the Director, MDNIY and Director, JIPMER for their support as this study was possible because ACYTER has been established as a collaborative venture between the Morarji Desai National Institute of Yoga, New Delhi and JIPMER, Puducherry with funding from Department of AYUSH, Ministry of Health and Family Welfare, Government of India. 1. Bhavanani AB, Swarodaya Vigjnan- A Scientific Study of the Nasal Cycle. Yoga Mimamsa 2007;39:32-8. 2. Deshmukh VD. Limbic autonomic arousal: Its physiological classification and review of the literature. Clin Electroencephalogr 1991;22:46-60. 3. Eccles R. Nasal airflow in health and disease. Acta Otolaryngol 2000;120:580-95. 4. Shannahoff-Khalsa DS, Kennedy B. The effects of unilateral forced nostril breathing on the heart. Int J Neurosci 1993;73:47-60. 5. Mohan SM. Svara (Nostril dominance) and bilateral volar GSR. Indian J Physiol Pharmacol 1996;40:58-64. 6. Raghuraj P, Telles S. Immediate effect of specific nostril manipulating yoga breathing practices on autonomic and respiratory variables. Appl Psychophysiol Biofeedback 2008;33:65-75. 7. Telles S, Nagaratna R, Nagendra HR. Breathing through a particular nostril can alter metabolism and autonomic activities. Indian J Physiol Pharmacol 1994;38:133-7. 8. Seventh Report of the Joint National Committee on Prevention, Detection, Evaluation, and Treatment of High Blood Pressure. US Department of Health and Human Services. NIH Publication No. 04-5230. Aug 2004. 9. Bhavanani AB, Madanmohan, Zeena S Immediate effect of sukha pranayama on cardiovascular variables in patients of hypertension. Int J Yoga Therapy 2011;21:4-7. 10. Madanmohan, Udupa K, Bhavanani AB, Shatapathy CC, Sahai A. Modulation of cardiovascular response to exercise by yoga training. Indian J Physiol Pharmacol 2004;48:461-5. 11. Prakash ES, Madanmohan, Sethuraman KR, Narayan SK. Cardiovascular autonomic regulation in subjects with normal blood pressure, high-normal blood pressure and recent-onset hypertension. Clin Exp Pharmacol Physiol 2005;32:488-94. 12. Udupa K, Madanmohan, Bhavanani AB, Vijayalakshmi P, Krishnamurthy N. Effect of pranayam training on cardiac function in normal young volunteers. Indian J Physiol Pharmacol 2003;47:27-33. 13. Prakash ES, Ravindra PN, Madanmohan, Anilkumar R, Balachander J. Effect of deep breathing at six breaths per minute on the frequency of premature ventricular complexes. Int J Cardiol 2006;111:450-2. 14. Pramanik T, Sharma HO, Mishra S, Mishra A, Prajapati R, Singh S. Immediate effect of slow pace bhastrika pranayama on blood pressure and heart rate. J Altern Complement Med 2009;15:293-5. 15. Joseph CN, Porta C, Casucci G, Casiraghi N, Maffeis M, Rossi M, et al. Slow breathing improves arterial baroreflex sensitivity and decreases blood pressure in essential hypertension. Hypertension 2005;46:714-8. 16. Dane S, Caliºkan E, Karaºen M, Oztaºan N. Effects of unilateral nostril breathing on blood pressure and heart rate in right-handed healthy subjects. Int J Neurosci 2002;112:97-102. 17. Jain N, Srivastava RD, Singhal A. The effects of right and left nostril breathing on cardiorespiratory and autonomic parameters. Indian J Physiol Pharmacol 2005;49:469-74.